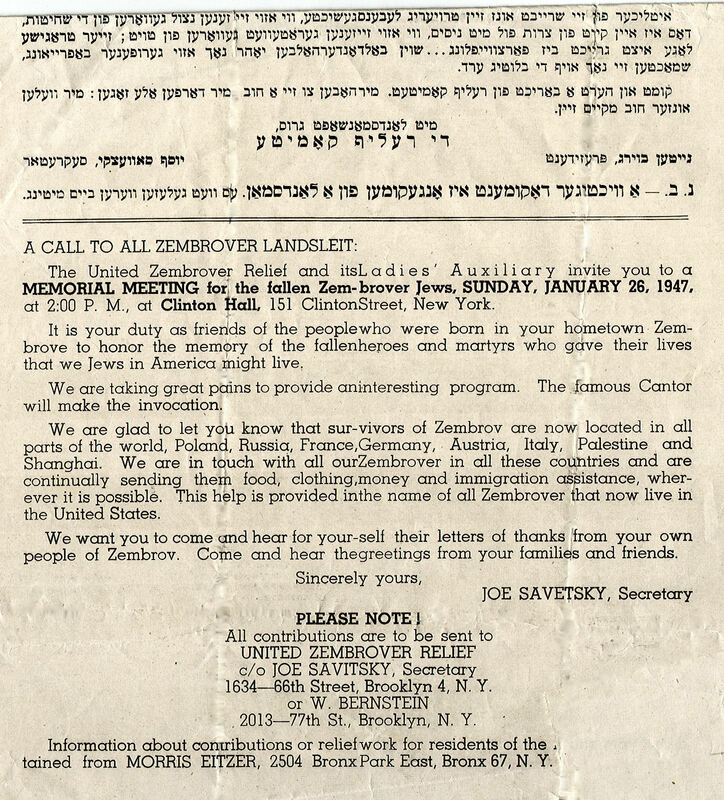 "The United Zembrover Relief and Ladies' Auxiliary invite you to a MEMORIAL MEETING for the fallen Zembrover Jews... It is your duty as friends of the people who were born in your hometown Zembrove to honor the memory of the fallen heroes and martyrs who gave their lives that we Jews in America might live...We are glad to know that survivors of Zembrov are now located in all parts of the world, Poland, Russia, France, Germany, Austria, Italy, Palestine and Shanghai. We are in touch with all our Zembrover that now live in the United States...We want you to come and hear for yourself the letters of thanks from your own people of Zembrov. Come and hear the greetings from your families and friends." "...I'd like to share these photos of the Zambrow cemetery taken by the field workers sponsored and guided by Yad LeZehava Institute in Kedumim. They were taken in 2006. One can see that the area is large and it is fenced in (though open in some places). the biggest problem isn't cleaning up as some suggest doing, since most of it was done by YZI. The Polish mayor also was present when the group worked there and gave full cooperation. 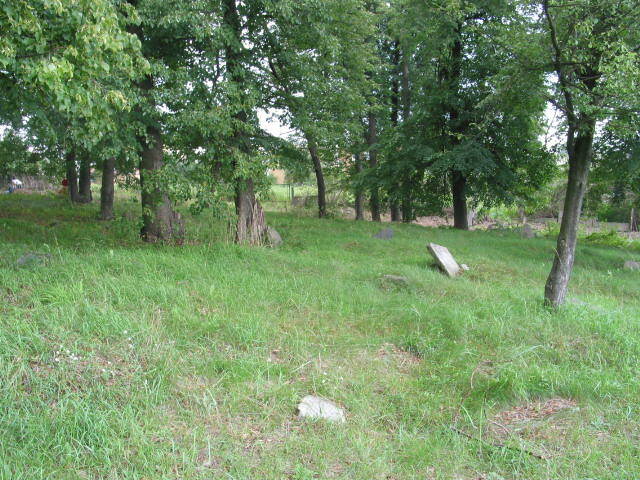 The undergrowth and trees are the biggest problem as many more stones are probably buried and undiscovered, hidden by foliage. This also makes reading the inscriptions tough. Lots of work was done to find as many as possible and clean them up. I don't think any more visible stones exist, but there are some standing which are totally unreadable or broken beyond (repair). 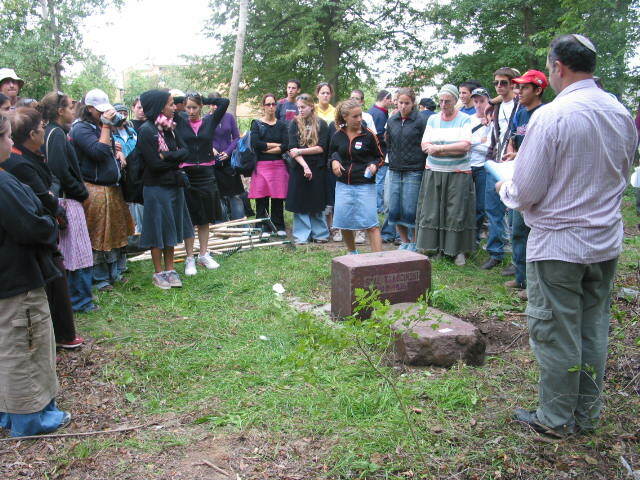 One photo (below) is (of) a wonderful rededication ceremony held for Gedalia Tykocinski, whose matzeva (stone) was partially buried and separated. 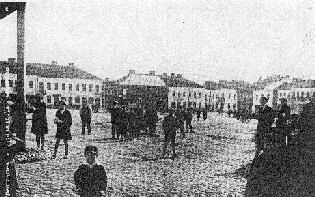 The workers put it together and said Kaddish over the grave when all was cleaned up." See photos below. Click on thumbnail versions to see enlarged images. Welcome to the Museum of Family History's Zambrow Forum. 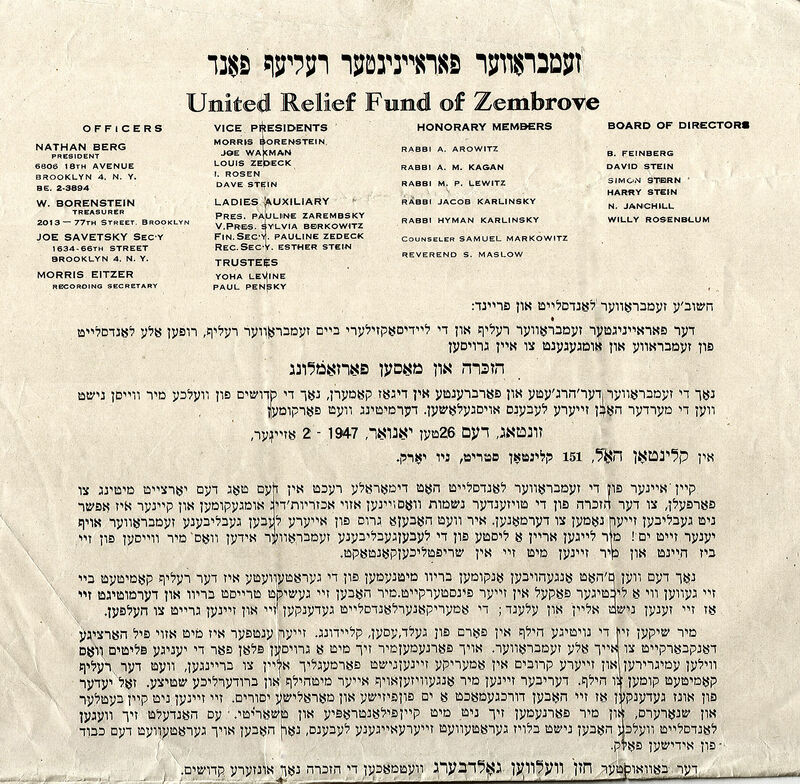 The Forum is designed to give those of you who are interested in Zambrow and the Jews who once lived there, the opportunity to post questions that relate to Zambrow and hopefully have them answered by somebody "in the know." Have you biographical information about a Zambrower family member that you'd like to share with others in the Forum? Have you family photographs or stories that might be of interest to others? Have you any sound or video recordings that might fit in with the theme of the Forum, that others might like to hear or see? If you have a photo or two of the person you wish to be represented that could accompany any biographical information, please send that to the museum too. Contact the Museum with any questions you have regarding the suitability of your material for the Forum. 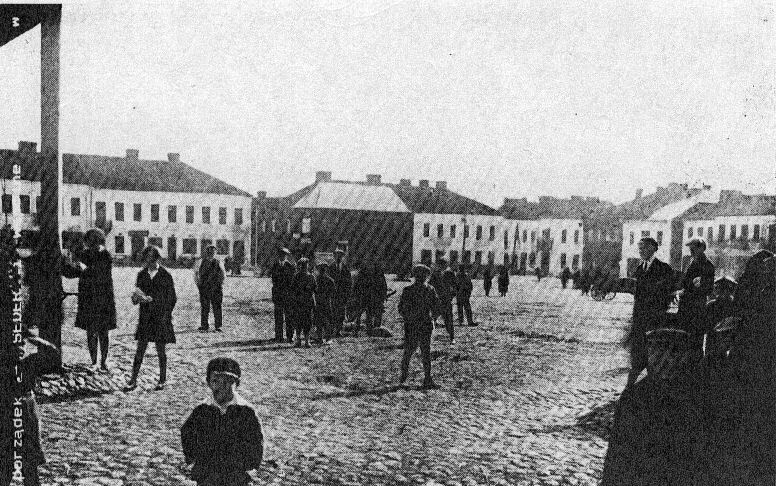 Much of the Museum material that is associated with Zambrow can already be found via the links established on the Museum's main Zambrow town page. To view the list of biographies and to read questions posed by our landsleit, please visit our main Zambrow Forum page. You can now read in Adobe pdf format the first issue of Landsleit, a periodic publication of the United Zembrover Society (editor Steven Lasky), by using the link provided. If your computer hasn't the capability to read pdf files, you can freely download the Adobe Reader which will enable you to do so. Scroll down to the "Download Now" tab and left-click on it to begin the download. The file size of the Reader is 22.4 MB. To post a message to the forum or to contact the museum with other questions you may have, please send your e-mail to steve@museumoffamilyhistory.com. 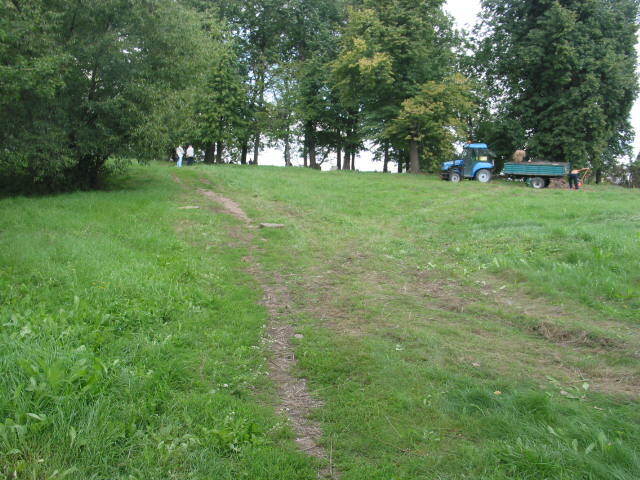 You can now see the data gathered from the gravestones (matzevot) still extant at the cemetery in Zambrow, Poland. You can see the information, as well as photographs of almost two dozen matzevot, by visiting www.museumoffamilyhistory.com/z/cem-zambrow-YZI.htm . You will first see a video slide show of the YZI work project from 2006 on the first page; the second page will contained the aforementioned photos and data.